Becca begins her hometown visits with Garrett, getting a tour around his California farm on the old John Deere. This is a big visit for Garrett because the last woman the family met was his ex-wife, so it gives him another opportunity to explain why she was terrible. His family doesn't want a crappy new girlfriend so they plan to drop the hammer if needed. Everyone sits down to dinner, toasts, then immediately gets up from the table for interrogation. Mom is the most protective and it seems to go well with Becca, but she's moreso concerned about how Garrett will take it if he isn't picked. Surprise, surprise the family comes around and approves of Becca, who is also very happy around snooze-worthy Garrett. Next up: a buffalo wing eating competition and some ice skating in Buffalo, New York with unexpected final four member Jason. Again, dinner is omitted to get right down to business and Jason's mom can't get a good read on Becca's true feelings for him. While Jason knows he's been playing from behind, he feels like their connection is surpassing the other guys (ehhh). Despite the whole family seeing the complete obvious outcome, they are supportive of their son. Before Becca leaves, Jason professes to Becca that he's in love with her to which she says, "That means the world to me." Romance! Across the country Becca travels for her hometown date with Blake in Colorado and she's in love with him but still hasn't told him. His hometown can't compare to the buffalo wing capital of the world, so Blake brings Becca to his high school to tour his alma mater. In a shocking reveal, Blake reveals that his high school was part of a school shooting and man, it's intense to hear. But there's still a surprise to come: a whole hometown crowd and a musical performance by Betty Who to surprise Becca in the auditorium. It's then off to meet Blake's family and yet again, mom is concerned about possible heartbreak seeing how hard he's fallen for Becca. Becca gets lightly grilled but overall everyone approves and Becca really likes Blake's family. Finally, it's the last stop of hometowns! Still in Colorado, Becca meets up with Colton and they surprise two kids in the hospital with toys and gifts - the softer side of Colton. Colton's got a pretty giant family lined up to meet Becca considering he doesn't introduce his girlfriends (18 people!). Colton brings up the Tia situation with his dad, and lets his mom know he had the virginity talk with Becca. Deep talks! Colton's dad tells Becca if she's not going to choose Colton to please dump him now to save him heartbreak later. Colton tells his mom he loves Becca and he thinks he could be engaged at the end of this. Becca likes Colton's family and it's a successful hometown visit ending with Colton telling Becca he loves her. Back to homebase of LA for Becca to choose which three men move along to the Fantasy Suite dates. But Becca needs a second opinion so she asks her gal pals from Arie's season to come listen to her vaguely recap her hometown dates and give their opinions. 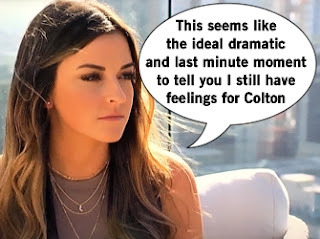 It's as if all of this is an elaborately staged plotline just to have Tia tell Becca extremely far in the process that Tia, in fact, does have feelings for Colton. Becca is shaken up because she supports her friend but also is supposedly falling for Colton. What's a girl to do? 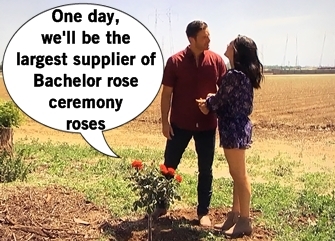 Colton asks Chris Harrison for Fantasy Suite advice for truly no good reason, then gets cut by Becca at the Rose Ceremony. Enjoy getting back together with Tia in Paradise, Colton!